Shop, browse, share & save on Modern, Southern Style whereveryou are. 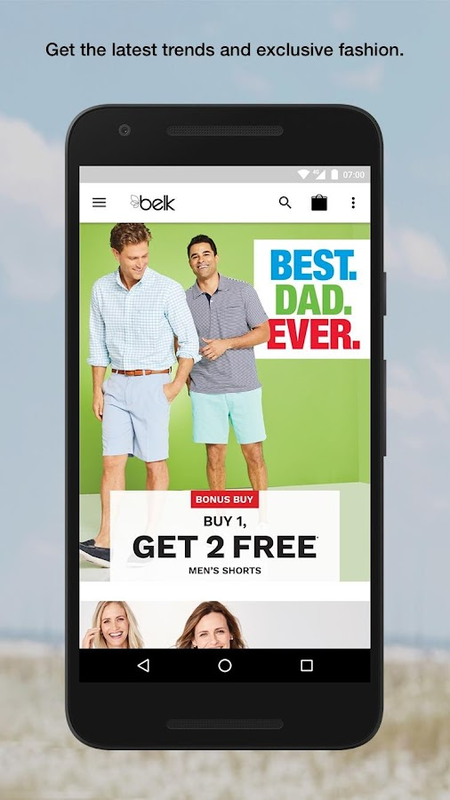 It’s the best of the Belk department store at yourfingertips! • Easily shop & browse for the newest men’s& women’s fashion trends from your favorite brands &designers: Polo Ralph Lauren, COACH, Crown & Ivy™, Lancôme,Wacoal, M•A•C, Clinique, Bobbi Brown, Estée Lauder, IZOD, Nautica& more. Designer shoes, boots, designer handbags, fragrances,designer watches and the best in beauty & fragrance—all in oneeasy and fun-to-shop mobile store! • Create and manage yourRegistry inside the Belk app! Easily browse and add items from yourfavorite brands, scan and add to your Belk Registry from your smartphone, maintain multiple registries, and quickly update your giftlist – now all inside the same app you love to shop. • Nevermiss a sale! Get push notifications on your phone & be amongthe first to shop and save on your favorite fashion from yourfavorite designers. • Find more fits & sizes! Scanbarcodes to get more product information. Can’t find your size instore? Find it online instantly! • Locate the Belk storeclosest to you. Get directions, contact information & storehours. • Get money-saving coupons and manage your BelkRewards Card account. Welcome to Belk on the go. Happy shopping! Now there’s more to love about the BelkWedding Registry. Our new app makes it easy to manage your registryon the go. Browse, update & share with your family &friends.- Create & access your Belk Wedding Registry anytime,anywhere. - Quickly update your account information & gift list.- Easily browse & add items from your favorite brands &designers to your registry. - Scan items directly from your smart phone or tablet to yourregistry.- Get organized with our registry tips & checklist.- Track gifts & gift-givers, making thank you notes easy tomanage. - Locate the Belk Home Store closest to you. Get directions,contact information & store hours. An elegantly designed shopping experience dedicated to helping youget your Penney’s worth! Welcome to the redesigned JCPenney App!See the latest below: Simplified Browsing A modern design thatmakes it easy to find the items you want for the prices that youlove. Now that’s getting your Penney’s worth! Buy In-App Pick Up InStore Quickly find those products you need, buy them in the app,and pick them up the same day in one of our stores! Save Coupons toWallet Not only are the coupons and offers just a swipe or tapaway, but now you can also save them to your wallet! Use thecoupons when shopping in app or show the barcodes to any JCPenneyassociate to apply them to your order! Never Miss A Deal Everyoneloves a great deal, and we want to make sure that you never missout on a deal again! Opt in to be one of the first customers to getnotified via push notifications or the JCPenney inbox of the latestpromotions and shopping events going on at JCPenney. Snap2Shop Scanbarcodes in store to learn more about the product, or take apicture of your favorite fashion items and we will find you similarproducts at JCPenney that you can purchase in-store or in the app!Favorites Save your favorite products for later and come back topurchase them at anytime! JCPenney Credit Card Managing yourJCPenney credit card is now easier than ever with our app! Now youcan easily view your balance, pay your bill, and see offers justfor JCPenney credit cardholders We love feedback! Love the JCPenneyApp? Please consider leaving us a 5 star rating! Questions orcomments? Please use the App Feedback section in the app or emailus at [email protected] We’d love to hear about your experience. Zilingo is a mobile marketplace where you can effortlessly shop forclothing, fashion accessories, home and lifestyle products FEATURES*The Best of Fashion, Beauty & Lifestyle in One Place Zilingobrings to your doorstep thousands of sellers and designers withtheir unique products. *Amazing Selection of Products Browse onlinethrough a huge collection across categories, trends and prices*Best Prices and Excellent Quality Discover fantastic deals infashion and lifestyle - right at your fingertips *Easy Payments Payonline or through cash on delivery - the choice is yours! *PersonalWishlist Save the products you want to buy on your personalwishlist and keep track of your favourite items *Stay Connected onZilingo Chat Chat directly with the seller and be assured of thebest quality *Shop with a Smile Our dedicated customer service isalways available to ensure worry-free shopping *Track your OrdersOnline Always know where your orders are through SMS and emailnotifications DESCRIPTION Zilingo is redefining the shoppingexperience in Thailand. All your favourite stores, designers andmarkets will now be on your phone, at your fingertips. ZilingoShopping Mobile App allows you to conveniently shop while you areon the go. You can discover the latest trends in fashion for bothmen and women - shirts, trousers, dresses, shoes, bags,accessories, swimwear, watches and much more. In home andlifestyle, shop home decor, funky gadgets and more. With dailydeals and discounts, you will find the best prices on offer. Browseon the app through hundreds of beautiful products for men and womenacross different categories. Add the products you love on into yourmobile app shopping cart. Pay easily through debit card, creditcard, online banking or cash on delivery. If you want to buysomething later, add products to your personal wishlist. If youhave questions about products or any brand store, you can easilyconnect to store owners through Zilingo Chat. To ensure a smoothmobile experience, the Zilingo Customer Happiness Team is alwaysavailable to take care of you and you will always shop with asmile. Your orders are all trackable through your mobile app,through SMS and email so that you will always know exactly whereyour order is and when it will arrive at your doorstep. All acrossThailand, you can get FREE home delivery to your doorstep. Younever have to worry about shopping again! Zilingo takes care ofeverything for you.